You see lots of great costumes at Days of the Dead events. 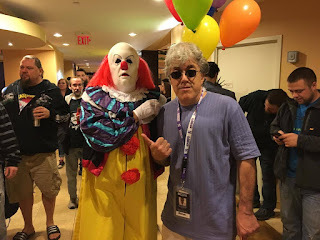 I always like seeing the various horror clowns. At the last Days (Chicago 2016), I saw a cosplayer as Pennywise, the frightening clown from It. Some people find clowns creepy. I find them fascinating. Either way, they are definitely colorful. I have to applaude the fan who goes as a clown, because it requires a lot of makeup work. I could have fun just people watching at Days. There are so many other great costumed fans. You'll see a lot of ladies as Harley Quinn and men as Joker, but you'll also see some obscure characters, too. Those people usually take it more seriously than anyone. It's all fun though! The next Days event is February 3-5 in Atlanta. You can check out DaydoftheDead.net for guest announcements and other info. A cosplayer and me in Schaumburg, IL-November 2016.